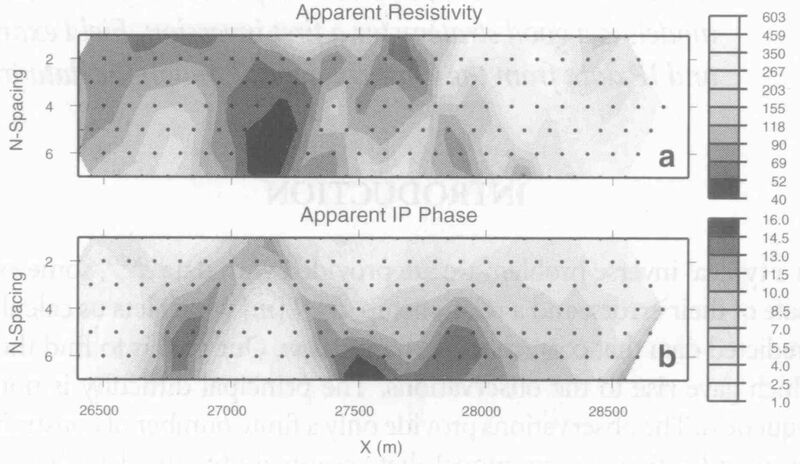 IP Inversion Provides Important Information about both Structure and Mineralization. The Century deposit is located in NW Queensland, Australia and is hosted by flat-lying siltstone and shale units. Mineralization occurs within black shale units as fine grain sphalerite and galena and is associated with bitumen-rich beds. Century is the second largest mine by revenue in Australia. A dipole-dipole Resistivity / Induced Polarization survey was completed using a configuration of n=1 to 7 with an a spacing of 100 m.
A 2D Inversion of the resistivity data nicely delineates the resistive overburden; however, resistivity does not correlate with mineralization.